If you spend time with youth in foster care, you will often find that they have a strong desire to change the system so that the kids that come behind them don’t have the same experiences. This is always a good starting point for advocacy. 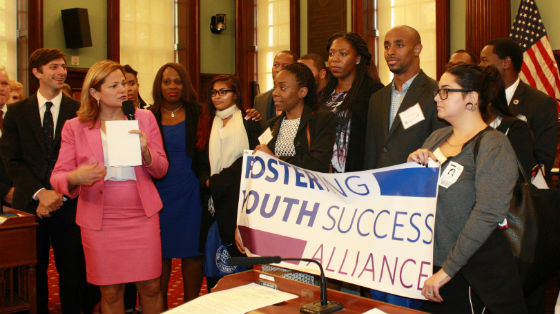 Last Thursday, 15 young adults in or recently aged out of foster care got the chance to see New York City Council up close through the Foster Youth Shadow Day. They had the chance to tell a number of council members about what life is really like for a youth in foster care, the many challenges they face with adapting to living within a “system,” and trying to navigate normal life events such as graduating from high school. A number of other council members also took active part in the event, including Dr. Mathieu Eugene, chair of the Committee on Youth Services; Andy King; and many others. Youth participants were able to spend time with members during one-on-one meetings, participate in a roundtable discussion on foster care policy, and assist the members in leading the City Council’s stated meeting. At the end of the day, the City Council issued a proclamation promising to do more on behalf of the 11,000 children and youth currently in foster care. The consensus among the youth is that it was an amazing day, both to understand how City Council works and to use their voice to make a difference for tomorrow’s youth in foster care.